Using drones in the study of leopard seals has proved to be faster and more cost-efficient than the traditional method of physically catching them. Leopard seals are massive creatures that can grow up to 2.4 to 3.5 meters in length, and weigh 200 to 600 kilograms. As an apex predator, information about their body condition is an indicator of the health of the ecosystem in the Antarctica. However, the traditional method of catching them, recording their vital statistics, and then tagging them before release is invasive, challenging and consumes much time and resources on the part of the researchers. In January and February 2013 and 2014, researchers from the NOAA Fisheries' Southwest Fisheries Science Center (SWFSC) and Aerial Imaging Solutions used drones to take 50 aerial photos of 15 unrestrained leopard seals. They caught and measured the same 15 seals. Then, they compared notes. It turned out that the accuracy of the length and weight measurements were within about two and four percent respectively. This was in contrast to the amount of time and effort involved in the two methods: In the traditional method, five people took more than four hours to catch each of the 15 leopard seals, while using the drone required just two people—and they took about 20 minutes to get the same information. The researchers published their findings in a recent issue of PLOS ONE. "We're certainly excited because we can get that much more work done, in less time, and at lower costs than ever before," said Douglas Krause, a research scientist from SWFSC's Antarctic Ecosystem Research Division (AERD). "It's a matter of keeping it simple, and focusing on the data we really need," Krause said. "This is a more effective and safer way to gather more of that data than we ever could before," he added. Studying leopard seals goes beyond simply finding out more about their species. "When we think about indicator species in Antarctica, we often think about highly abundant species such as penguins," said co-author Jefferson Hinke, a research scientist in the AERD. "But top predators, such as leopard seals, are also sensitive to their environment and monitoring them provides additional information on the status of the Antarctic ecosystem." 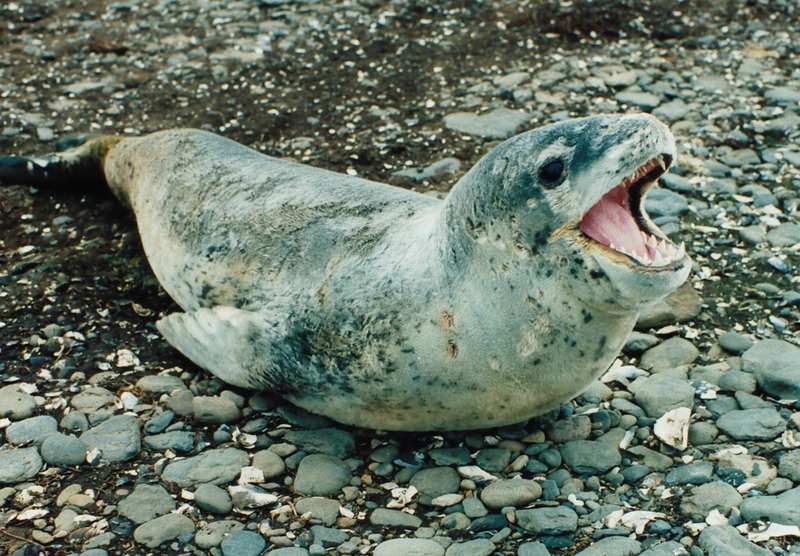 Leopard seals prey on penguins and Antarctic fur seals, and these animals feed on krill. By studying leopard seals, researchers can keep updated on the health and abundance of krill, and this information can help fisheries managers assess how much the fishing fleet can catch for the season.